Alexa Hoover didn’t know she was in Sports Illustrated until her phone started buzzing with texts. 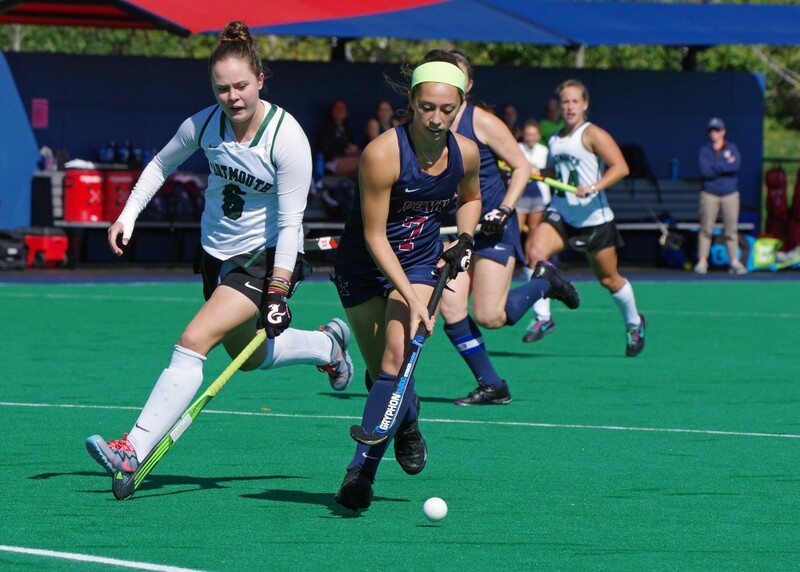 One by one, her friends and teammates on the Penn field hockey team congratulated her for being featured in the “Faces in the Crowd” section of the iconic sports magazine. Even then, she had a hard time believing it. Does Hoover, who currently ranks first in the nation in goals per game (1.92), feel like a celebrity? Are people around campus recognizing perhaps the best athlete at Penn right now? It shouldn’t be surprising that Hoover wants to use her newfound fame to benefit the team. Despite being in the midst of an incredible individual season in which she’s already shattered the program’s single-season record for goals (23) and points (52), her coach and teammates insist you wouldn’t know it from how humble she is and how much she tries to blend in with the group. And that’s been a big reason why the Quakers are a blistering 10-2 heading into their final four games of the season, starting with tonight’s contest against crosstown rival Drexel. 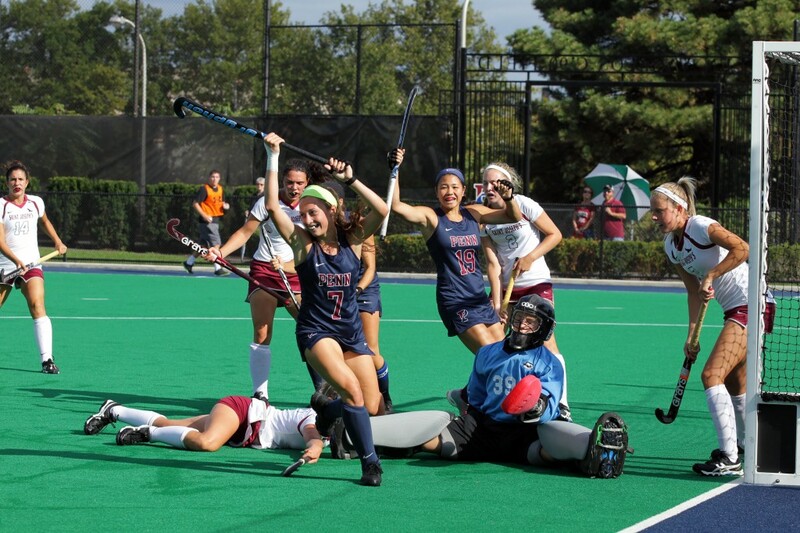 Alexa Hoover celebrates one of her 23 goals this season. No other Penn player has ever scored more than 20. In addition to helping the team’s current players, Fink also said that Hoover is helping her lure recruits to Penn because “people want to play with her.” Meanwhile, it wasn’t that long ago when Fink and her staff worked tirelessly to use their own recruiting tricks to bring Hoover to Penn, including the allure of playing on the new Ellen Vagelos field, to snag a dynamic player who was being courted by bigger programs. And it immediately paid huge dividends with Hoover winning Ivy League Rookie of the Year honors last year before being named Ivy League Player of the Week four times this season (a Penn record) and scoring five goals in a game vs. Saint Joseph’s last month (another Penn record). 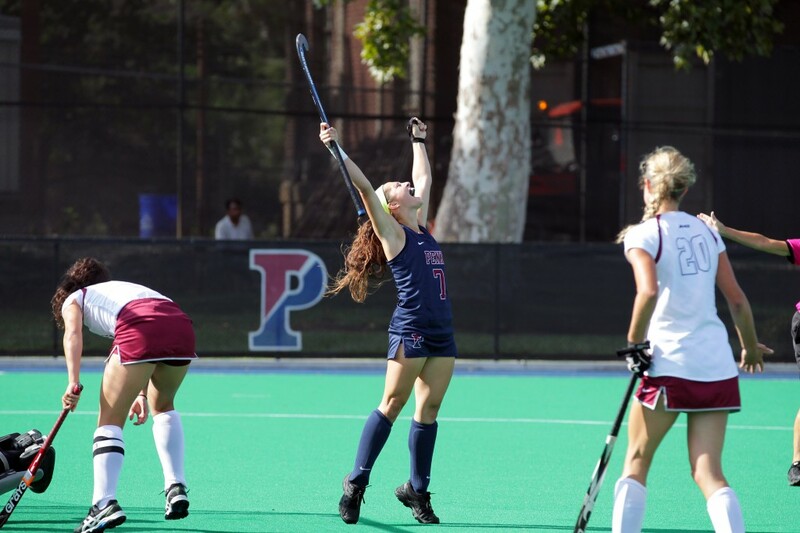 Most recently, she had two goals and an assist, including a great game-winning goal in overtime, to lead Penn to a 3-2 win over Bucknell on Sunday just two days after a rare setback to Columbia. Hoover has scored in all but two games this season and ranks second nationally in points per game. Fink said that over the past few weeks many people have asked her if she saw this coming. And while she couldn’t have predicted that Hoover would become one of the top offensive players in the nation, she has known for a while that she was a great player — ever since she and her current assistant Katelyn O’Brien watched her dominate a Pennsylvania tournament as a 12-year-old. Hoover’s scoring rate has since slowed down — but not by much. And her coaches aren’t about to take her out of any games as they hope to challenge perennial powerhouse Princeton for the Ivy League title and earn a spot in the NCAA tournament for the first time since 1993.